FACT CHECK: 14th Amendment On Citizenship Cannot Be Overridden By Executive Order President Trump is floating a new tactic in his immigration crackdown — he wants to end the right to citizenship for babies born in the U.S. to noncitizens. Few legal experts believe it can be done. 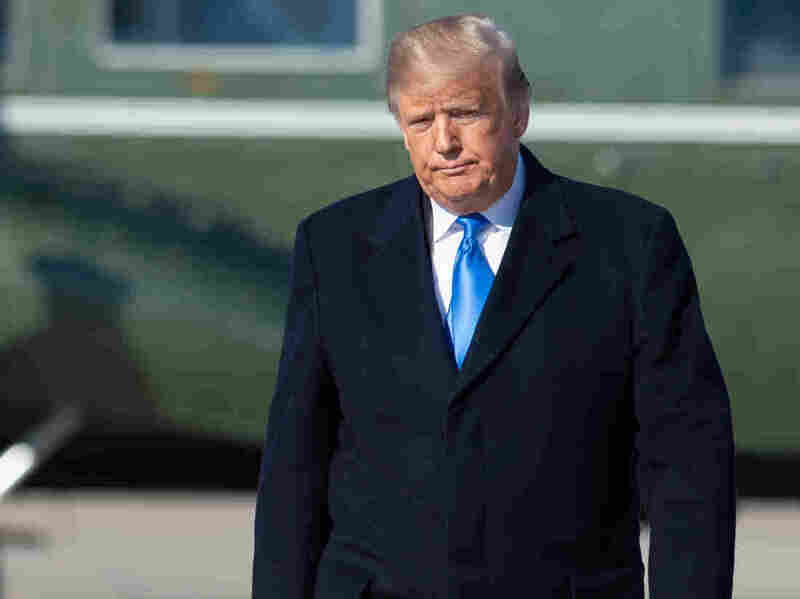 President Trump prepares to depart for Pittsburgh, where 11 people were killed Saturday in a mass shooting at the Tree of Life synagogue. In an interview with Axios, the president says he intends to sign an executive order ending birthright citizenship. President Trump says he can end birthright citizenship with an executive order. But most legal scholars — and even leaders of the president's own party — are skeptical. In an interview with Axios, published Tuesday, the president said he wants to end the automatic right to citizenship for babies born in the U.S. to noncitizens. "You can definitely do it with an act of Congress," Trump said in the Axios interview. "But now they're saying I can do it just with an executive order." Trump may have a lawyer who is telling him the 14th Amendment means something else, but that lawyer is like a unicorn. The 14th Amendment holds that "all persons born or naturalized in the United States, and subject to the jurisdiction thereof, are citizens of the United States." Most legal scholars take that as an explicit protection of birthright citizenship — and think it will take much more than an executive order to change that. "Trump may have a lawyer who is telling him the 14th Amendment means something else, but that lawyer is like a unicorn," said Rebecca Hamlin, a professor of legal studies at the University of Massachusetts, Amherst. Trump's proposal seems to rely on the work of a small but vocal group of conservative legal scholars who argue the 14th Amendment has long been misread. In particular, they argue, five key words — "subject to the jurisdiction thereof" — have been misread and that the authors of the 14th Amendment did not intend to give citizenship to the children of temporary visitors and other noncitizens. "We've got this notion that just kind of developed over the last 40 or 50 years that is completely without any sort of legal authority," said John Eastman, a constitutional law professor at Chapman University and a senior fellow at the Claremont Institute. Most legal scholars say the Supreme Court settled this debate more than a century ago, holding that "subject to the jurisdiction thereof" refers to anyone present in the U.S., except for the children of diplomats and enemy soldiers (and, at the time, Native Americans). "I think it's kind of a lunatic fringe argument," said Margaret Stock, an attorney at the Cascadia Cross-Border Law Group in Anchorage, Alaska, and a former law professor at the United States Military Academy at West Point, N.Y. "I've been debating folks like this for more than a decade, and they claim that the 14th Amendment's been misinterpreted," she said. "And now they've got a president in office who apparently was fixated on this as well." Trump's critics say the proposal's timing — just a week before the midterm elections — suggests that it is intended to motivate his political base. "This is about getting the base worked up before the midterms," Hamlin said. "He may not ever even issue the executive order that he floated in the Axios interview." Even Paul Ryan, the speaker of the House of Representatives, thinks the president's proposal is unlikely to succeed. "You cannot end birthright citizenship with an executive order," Ryan said Tuesday in an interview with Kentucky radio station WVLK. "You know as a conservative, I'm a believer in following the plain text of the Constitution," Ryan added. "And I think in this case the 14th Amendment is pretty clear, and that would involve a very, very lengthy constitutional process."